We saw how to create a new build configuration and, optionally, create a matching solution configuration. You can also create a new solution configuration and, optionally, create new matching build configurations in each project. To create a new solution configuration, first open the Configuration Manager. 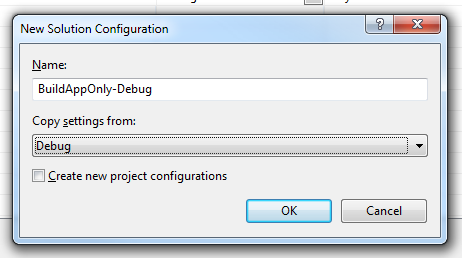 You’ll see the New Solution Configuration dialog. Give the new configuration a name and pick a solution configuration that you want to copy settings from. After pressing OK, you can set build configuration and platform choices for the new solution configuration. 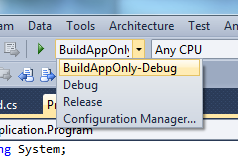 In the example below, we’ve created a new configuration that uses the same build configuration choices as Debug but builds only the top-level application. We now see our new solution configuration as a choice in the main solution configurations dropdown.